Are you ready for windows that can double as solar panels? It could happen sometime in the near future thanks to work done by scientists at Los Alamos National Laboratory and University of Milano-Bicocca (UNIMIB), Italy. 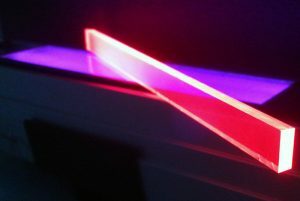 They are using quantum dots to harvest the energy from sunlight over a large surface area (say, a window), shifting the wavelength of the sunlight and focusing that energy onto a smaller solar cell mounted along the edge of the material. Quantum dots are a relatively new material consisting of nanoscale semiconducting crystals. Each crystal has a unique property of fluorescing different colored light depending on their size. The larger the crystal, the larger the frequency of emitted light. The quantum dots used by the Los Alamos/ UNIMIB group use are large for quantum dots, on the order of 100 nanometers. This is done to increase the frequency shift of the light to avoid losses of energy due to reabsorption in the window material. It will be interesting to see where this research will go next. Will our windows double as solar cells in the future? This technology could make for some interesting colored windows as well, just by changing the size of the quantum dots. ← What Is the Difference Between Accuracy and Precision?